Dear Riffs, Beats, & Codas reader: I wrote a review of Bruno Mars’s XXIVk Magic when it first came out in late 2016 but never published it. His recent victory at 2018's Grammys inspired me to dust if off and revisit my original sentiments, which remain the same. He was among the few nominees’ whose work I was familiar with so his wins validate my sense that he is an interesting musician. The wins also reiterate why he needs to try something new if he wants to become a great artist rather than a merely entertaining one. 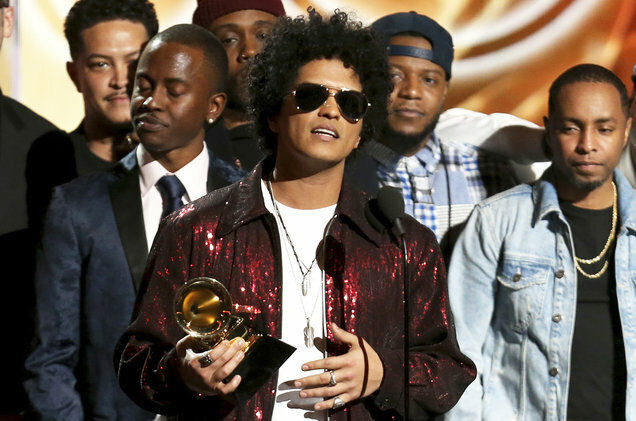 After successfully channeling elements from Michael Jackson, Prince, James Brown and The Police on his albums Bruno Mars scored his biggest hit in 2014 on the throwback Minneapolis funk of the Mark Ronson produced “Uptown Funk.” Sultry, danceable and melodic it’s one of those inevitable hits that’s simply undeniable. It topped the pop charts for 14 weeks and won Mars and Ronson two Grammys, including the main platter Record of the Year. Several weeks ago Mars built on this winning streak by winning six more including Record (“24 K Magic”), Song (“That’s What I Like”), Album (XXVk Magic), R&B Song (“That’s What I Like”), R&B Vocal (“That’s What I Like”), and R&B Album (XXVk Magic). Mars celebrates his passion for 1980s and 1990s R&B on his 2016 chart topping, Grammy winning album XXIVk Magic. On the top 10 hit title track he dips into the Roger Troutman & Zapp playbook with a funky bottom borrowed from 1990s hip-hop. “Perm” is pure James Brown funk. I hear traces of Bobby Brown style New Jack swing in “Straight Up & Down.” The torchy soul ballad “Too Good to Say Goodbye” is the kind of large scale vocal and emotional workout Peabo Bryson, Jeffrey Osborne and Freddie Jackson built their careers on. From one listen, its clearly state-of-the art 1980s pop-funk dressed up in post-millennial production. As an album for cruising or for throwing on at a party album it ebbs and flows perfectly. Mars’s melodic gifts also place him at the forefront of today’s pop songwriters. You will definitely hum these tunes after hearing them once or twice. A few challenges could disrupt the non-stop Mars party. In playing to past strengths Mars risks pandering to his established audience. His love for funk styles of the past is admirable, but he has shown a broader stylistic range on his two previous albums. In the digital era, albums are often grab bags of styles. The downloadable buffet approach takes pressure off artists to make coherent suites. Still, he has traded the stylistic playground for an entertaining but overly familiar set of grooves. Further, songs like 2010’s “Just the Way You Are” demonstrated a sweet side but the sour element sometimes threatens this balance in his lyrics. By intentionally writing songs aimed at players and party people (ostensibly male) he tends to write about little beyond partying and seduction. Mars receiving one of six Grammy Awards on February 28, 2018. The music industry celebrated his well-crafted melodic pop, but is his music growing stale? He sings to a female suitor that it’s good they like the same things in “That’s What I Like.” Meaning…she would be screwed if they didn’t? The melody of “Versace on the Floor” is enchanting and the crooning is expert. But, the song is almost parodic in its one-dimensional focus on literally getting a woman’s clothes off. Love songs are de rigeur in pop but there is a lot of effort here for very thin ideas. XXIVk Magic solidifies Mars as a master of funk pastiche, and as a nine-song album, he is wise enough to not overstay his welcome. Still, I sense there are deeper and more interesting stories he could tell especially with his encyclopedic musical knowledge. I hope that as he plans his next album he tunes out the retro hits and trusts his own groove more.